The first time I actually put my money into VR was summer 2014, when I received a Rift DK2 after putting together my first PC from parts purchased on Amazon and elsewhere. Since then, I’ve purchased multiple Android phones for their VR capabilities despite using an iPhone for everything else. I would have preferred to buy a Mac instead of a PC, and only own one phone instead of two, but no Mac or iPhone would let me explore a trend I considered likely to reshape the world. Apple keeps acquiring companies related to VR and AR and its CEO indicates the company is at least interested in these areas. Still, for a certain Apple-buying subset of people wanting to explore the potential in VR, there remains no hardware or software with which to play around. You can buy or build a Google Cardboard for iPhone. That’s about it. The $500 VR Dev Kit from Occipital might change that, opening up VR to Apple-centric developers while also being available to others interested in VR’s next steps. More importantly for Occipital, which is based in Boulder, CO and San Francisco, CA, the kit might entice manufacturers to consider integrating the company’s Structure Core 3D sensor directly into mobile devices. Occipital is announcing the VR Dev kit today, promising a sensor meant to provide inside-out position tracking for phones, including iPhones. 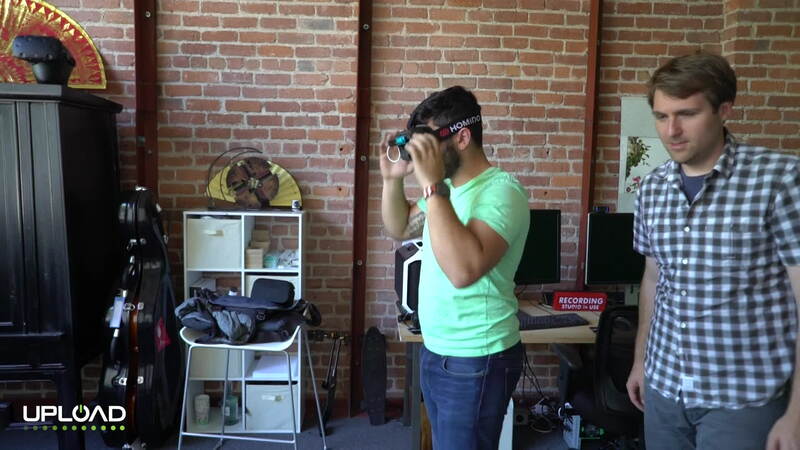 The kit made its way to our office in San Francisco where we tried out room-scale iPhone-powered VR enabled by the Structure Sensor. The demo is an extension of what we saw at CES in January from Occipital — a tablet-sized sensor that could turn an iPad into a robust augmented reality device. A position tracking solution built for a mobile VR headset needs to achieve incredible performance metrics to keep the person wearing the headset from feeling sick. In addition, to become consumer-ready, the solution can’t run the battery down too quickly. Not to mention, the performance of any add-on position tracking system on an iPhone is going to be partly limited because the current devices also lack the right “low persistence” screens for great VR. That said, Occipital claims its VR Dev Kit enables room-scale (“and beyond”) 6 degrees of freedom position tracking for mobile VR. The processing for the sensor is said to only require a portion of a single mobile chip core, which suggests the approach might not require too much battery power. The system also claims to have very low jitter (“0.4 mm RMSE when measured 1.5 meters from a tracked scene”) and latency is said to be less than “10 ms to return a full tracked pose after a frame is received from the optics.” What we felt trying the system seemed like the total latency was slower than 10 ms, but it’s a hard thing to gauge. Upload tested out the sensor first by scanning a room at our offices using a hand-held iPhone with the Structure sensor attached to the back. It created a 3D map of our room just by taking the iPhone around and letting it have a good look at different areas. Then we launched an app, put on the iPhone/Structure Sensor-equipped headset and walked around a different virtual environment. Any time the person wearing the headset approached a wall or object a glowing outline of the real world seeped into the virtual world. We are told the tracking system would work without the initial scanning step, but that the collision detection feature requires the 3D scan first. Not worrying about bumping into a wall or a chair while moving around in VR creates a freeing experience. Seeing a real-world object appear in VR shows the room exactly when you might need it most — to avoid a collision or sit down. The system is selling for $500 and interested developers can apply for a kit here, which includes an “HMD with custom faceplate, phone case, Structure Sensor and 120-degree wide vision lens.” The HMD viewer is a Homido 1 VR viewer, as well as a wide angle lens which converts the iPhone’s camera to a much wider one. Overall, this looks like an interesting way to start preparing for the future. 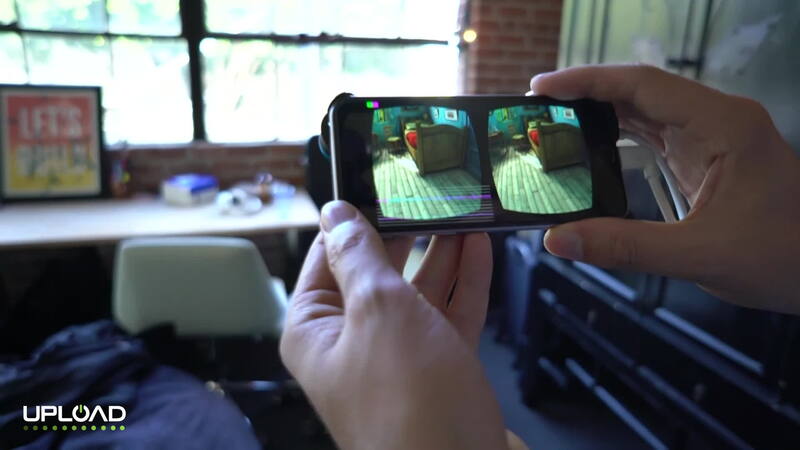 Mobile VR is going down the path of position tracking, as well as incorporating elements from the world around you into your experience, as both Intel and Qualcomm have demonstrated recently. This could help developers start thinking about and developing experiences with those feature sets, and moving away from the don’t-lean-around variety of VR seen with the current Samsung Gear VR and Google Daydream mobile headsets. Az Balabanian contributed to this report.